Hope you found lesson 166 helpful. 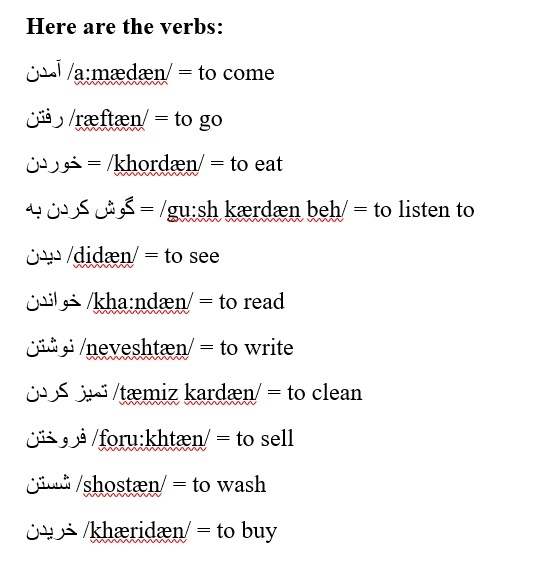 What we are going to do today is to use the verbs we used last week (lesson 166) and make negative sentences in simple past tense. 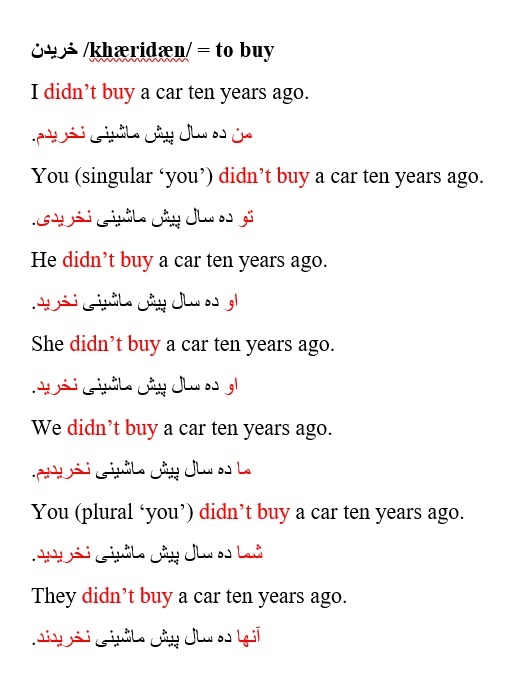 If you have no idea how to make a negative sentence in simple past tense, please visit Lesson 18 first. Thanks. I didn’t go to Brazil in 2014. 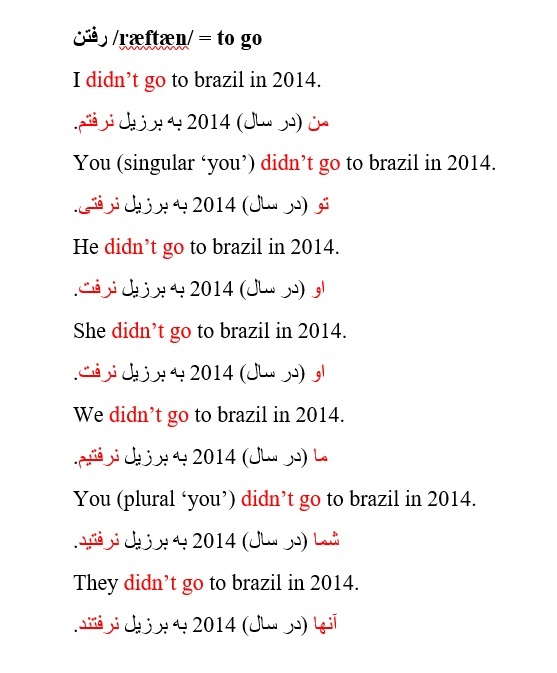 You (singular ‘you’) didn’t go to brazil in 2014. He didn’t go to Brazil in 2014. She didn’t go to Brazil in 2014. We didn’t go to Brazil in 2014. You (plural ‘you’) didn’t go to Brazil in 2014. They didn’t go to Brazil in 2014. I didn’t eat a lemon last night. 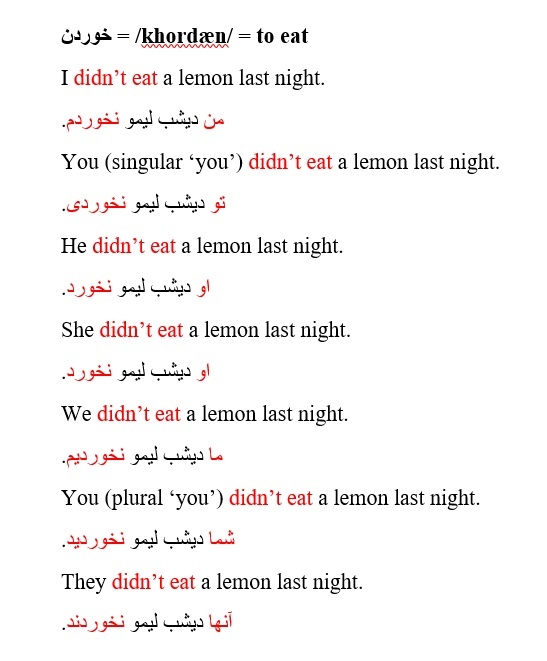 You (singular ‘you’) didn’t eat a lemon last night. He didn’t eat a lemon last night. She didn’t eat a lemon last night. We didn’t eat a lemon last night. You (plural ‘you’) didn’t eat a lemon last night. They didn’t eat a lemon last night. I didn’t listen to the radio yesterday. You (singular) didn’t listen to the radio yesterday. He didn’t listen to the radio yesterday. She didn’t listen to the radio yesterday. We didn’t listen to the radio yesterday. 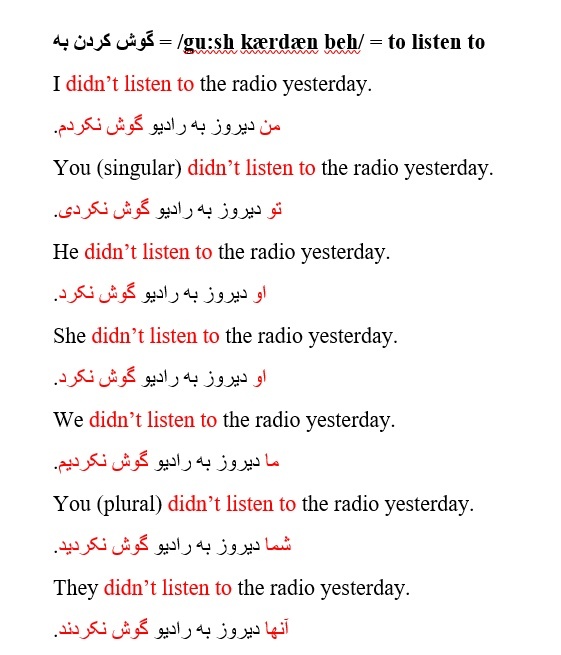 You (plural) didn’t listen to the radio yesterday. They didn’t listen to the radio yesterday. I didn’t see your friend yesterday. 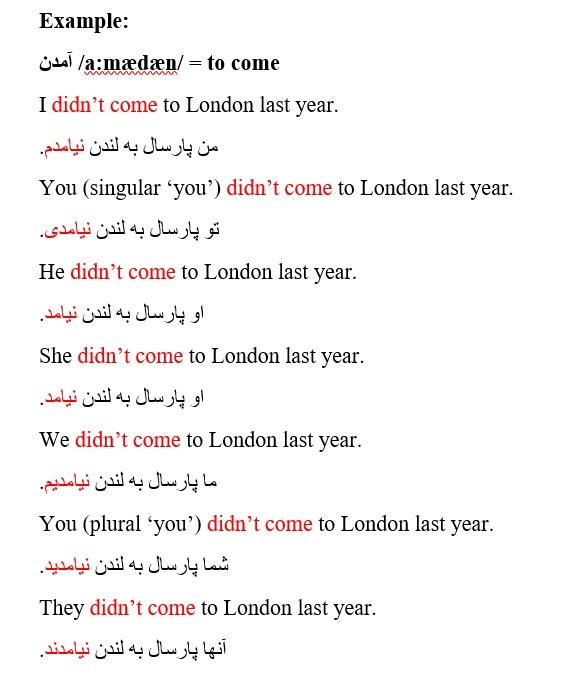 You (singular ‘you’) didn’t see your friend yesterday. He didn’t see your friend yesterday. She didn’t see your friend yesterday. We didn’t see your friend yesterday. 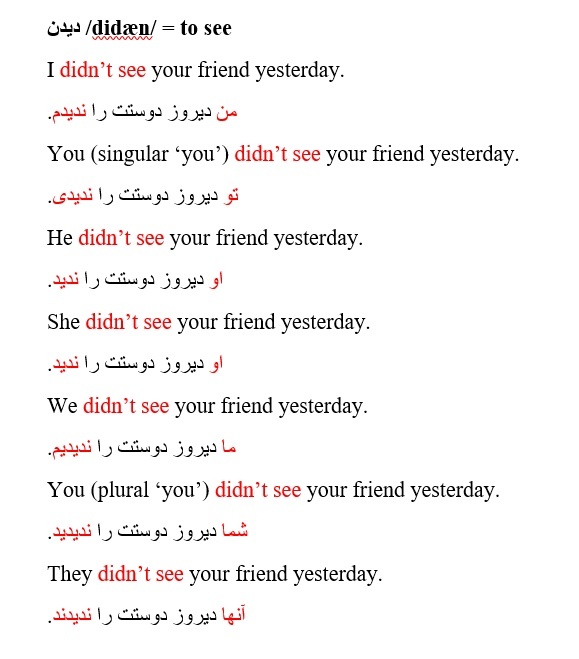 You (plural ‘you’) didn’t see your friend yesterday. They didn’t see your friend yesterday. I didn’t read a book last week. 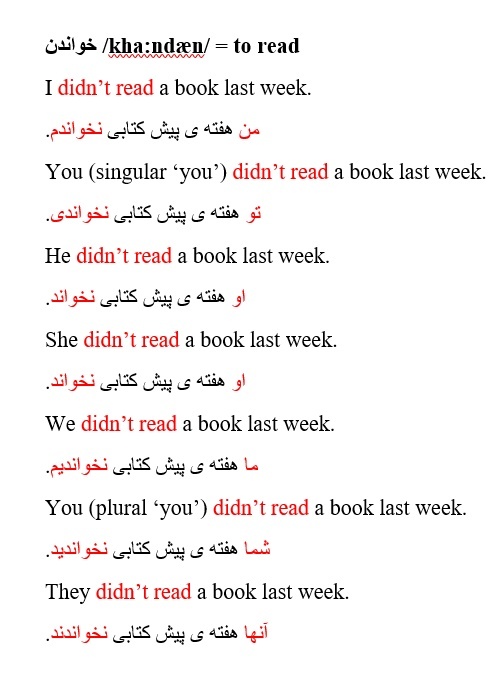 You (singular ‘you’) didn’t read a book last week. He didn’t read a book last week. She didn’t read a book last week. We didn’t read a book last week. You (plural ‘you’) didn’t read a book last week. They didn’t read a book last week. I didn’t write a letter today. 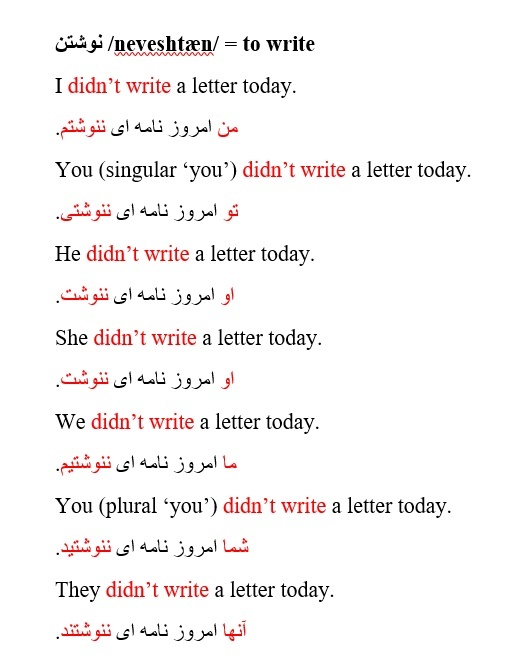 You (singular ‘you’) didn’t write a letter today. He didn’t write a letter today. She didn’t write a letter today. We didn’t write a letter today. You (plural ‘you’) didn’t write a letter today. They didn’t write a letter today. I didn’t clean my car this morning. You (singular ‘you’) didn’t clean my car this morning. He didn’t clean my car this morning. She didn’t clean my car this morning. We didn’t clean my car this morning. 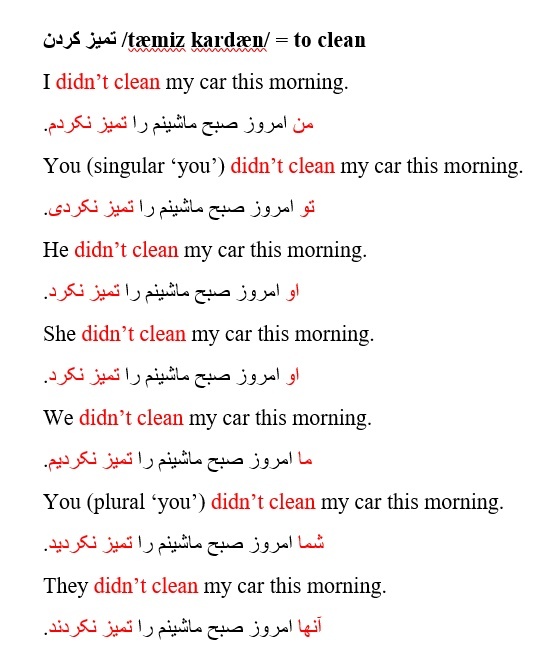 You (plural ‘you’) didn’t clean my car this morning. They didn’t clean my car this morning. I didn’t sell my house two years ago. 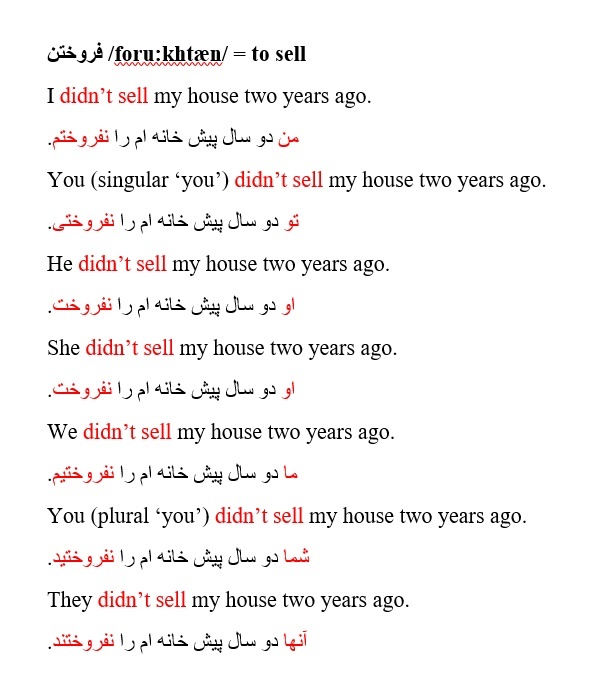 You (singular ‘you’) didn’t sell my house two years ago. He didn’t sell my house two years ago. She didn’t sell my house two years ago. We didn’t sell my house two years ago. You (plural ‘you’) didn’t sell my house two years ago. They didn’t sell my house two years ago. You (singular ‘you’) didn’t wash the dishes last night. He didn’t wash the dishes last night. She didn’t wash the dishes last night. We didn’t wash the dishes last night. 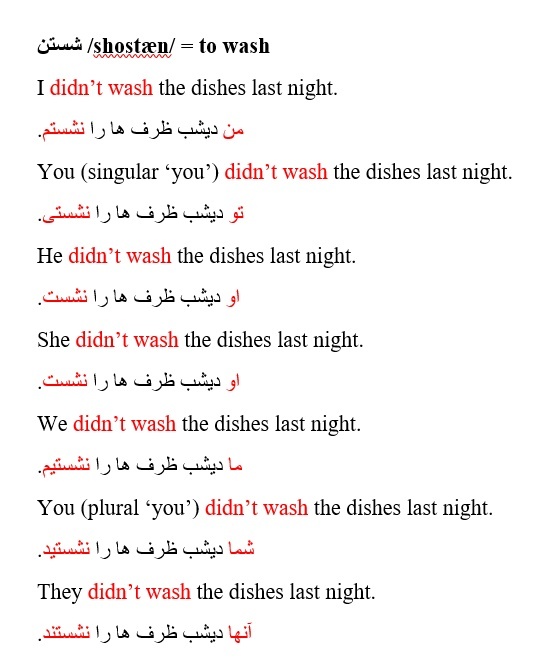 You (plural ‘you’) didn’t wash the dishes last night. They didn’t wash the dishes last night. I didn’t buy a car ten years ago. You (singular ‘you’) didn’t buy a car ten years ago. He didn’t buy a car ten years ago. She didn’t buy a car ten years ago. We didn’t buy a car ten years ago. You (plural ‘you’) didn’t buy a car ten years ago. They didn’t buy a car ten years ago. All right. Hope you enjoyed this lesson. Keep practising. See you next week.